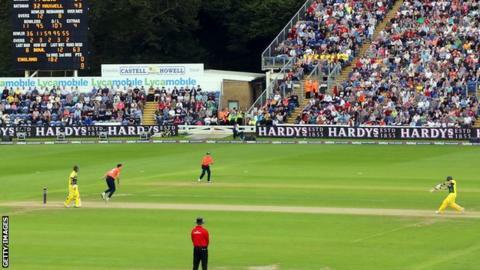 The SSE Swalec Stadium was the venue for an Ashes Test and a double-header of men's and women's T20 games. The club turned in an operating profit of £593,000 after losing £87,000 in 2014. But the accounts also show a fall in income from domestic cricket. Chief executive Hugh Morris highlighted the success of staging international cricket in his report to members for the annual general meeting taking place on 31 March. "Our priority was to deliver sell-out crowds and we were delighted to fill the ground not only for four consecutive days of Ashes cricket, but also for the T20 international," he wrote. "We were particularly proud to receive our highest ever customer experience rating for the Ashes Test." The match was the third Test in Cardiff, which will host England one-day matches against Sri Lanka and Pakistan in 2016, with international games scheduled until 2019. 2015 saw Glamorgan finish fourth in division two of the Championship and narrowly miss out on a place in the T20 Blast quarter-finals. Morris warns the club must improve its income from county cricket and from the use of the stadium, admitting that membership numbers and money taken on the gate from spectators are on the decline. "The current squad size and the development of our own cricketers are only going to be improved by increases in our own income," he wrote. "It is vital we improve our core product, increase gate numbers, revitalise memberships, attract sponsors, consolidate our conferencing business, and development other sources of income." Pop group Simply Red will headline the first major music concert at the stadium in July with another concert to be announced shortly. But the financial year was also notable for the club having to ask for major debts to be written off. Cardiff Council agreed for £4.4m of debt to be cancelled, while Allied Irish Bank also agreed a 70% write-off of its debt and former chairman Paul Russell accepted a 75% loss. Morris's report thanked departing coach Toby Radford and groundsman Keith Exton for their work, while urging members to get behind new head coach Robert Croft and captain Jacques Rudolph.